The 1st gen Focus was a cheap front-wheel-drive economy car, but if you subscribe to William James' theory of unlimited parallel universes, there has to be a universe where the Focus was a cheap rear-wheel-drive V8 economy car. This one must have slipped through a worm hole into ours. The US market Ford Focus was launched in 2000 with Ford's "New Edge" styling, a unifying design theme dreamed up by Ford's VP of Design Jack Telnack. The Mustang also got New Edginess in 1999 as well as the Cougar (and others) but, mercifully, the cars were allowed to return to segment based styling a few years later. The 1st generation Focus is a cheap beater today, and a surprisingly large number have been converted to V8-rear drive brutes from a variety of tuners, madmen and enthusiasts. 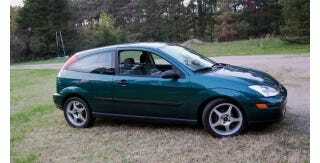 Find this 2000 Ford Focus V8 Swap offered for $18,000 in Holland, MI. Featured by Zaqataq on jalopnik oppositelock forum. The Focus isn't a bad looking car - in fact it looks like any number of mid nineties to late oughts hatchbacks and isn't something you'd be ashamed to drive to work each day. The sporty SVT model was even fast in its own right, but today's front-V8, rear drive conversion puts any stock Focus to shame. Under the hood is a carburetor equipped 302 cubic inch Ford V8, good for 340 horsepower with the E303 camshaft and sold from the Ford racing parts catalog for around $4k. The rest of the parts to convert the Focus from a transverse engine front drive to a classic rear drive setup will set you back quite a bit more, the seller of this car claims to have $21k in parts in the car. Originally posted as 15k: Rear Driver: 2000 Ford Focus V8 Swap on Daily Turismo.